So I had a question.. This one baby does not look "normal" I don't know if it developed this after a while, or if it some sort of genetic thing.. Anyway, it doesn't look like its siblings. 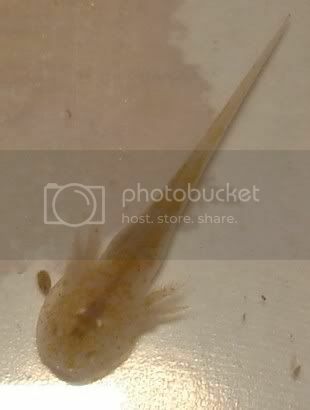 Its gills are smaller and pulled to its sides more. Is that one the smallest of the bunch, and are you feeding them frozen bloodworm or still feeding them with live food as well? How long is this small one? I have only a few left from the 20 I raised and the smallest one still won't eat dead stuff, prefers the daphnia or live bloodworm or tiny earthworms. It's gills compared to the others are relatively smaller than the others, like your photo. I've had him/her pretty much separated completely from a few weeks after it hatched as s/he didn't seem to be developing as fast as the others, and was a little stressed (tail curling at the tip and floating sideways or upside down more often than the others and unable to turn itself). Since separating, it's still pretty slow growing, eats only live and am now able to raise the water more as no telltale tail curling or floating. Only suggestion is if you haven't already done so, keep it separated and feed it so you can gauge whether it does eat or not and how much, lower the water if it floats. If it doesn't appear to eat the dead bloodworm, find some live food that it will eat, even if need be hatching some brineshrimp eggs or ordering daphnia online (if you don't have any). Last edited by kapo; 17th June 2007 at 02:51. All of them are eating bloodworm (some more than others), and I still also give them some live daphnia. My daphnia population has never been strong, so I've just been giving them less daphnia as I give them more bloodworm. For about a week the tiny one wouldn't eat bloodworm, but now, it will occasionally eat one or two of the SMALLEST bloodworms I can find (I hand feed them all because I don't want to leave bloodworms in there to foul their containers). Each axie baby is in it's own little snack container, so they are all separated. The tiny one, lengthwise, is about the diameter of a quarter. Most of the others are that size or a bit bigger. But it is also, proportionally, smaller overall than the other ones. I guess I just keep raising it and see what happens. But I dunno what to think of it. Do you think it's just genetic/developmental? Or do you think it might be sick? I didn't notice if it used to be "normal" and something happened to it or if this is just the way it is cause it's growing slow or something.. I think, based on the ones I raised, that it's developmental, there will always be the smallest weakest, and strongest in any spawning, hence the reason there's always so many eggs lain. Maybe just feed the live daphnia to the smallest one, and the bloodworm to the others if they're doing okay. Are you able to get live earthworms, or live blackworms?